Nearly 60% of shoppers look up product information and prices while using their mobile phones in stores, making a mobile strategy critical for retailers. Editor's note: The following is the sixth installment in Retail Dive's Consumer Survey, a six-part series examining the psyche of the American consumer and the evolving role of the brick-and-mortar store in the shopping journey. Check out all of our results on our landing page. Thanks to mobile devices like smartphones and tablets, on-the-go consumers have ready access to all kinds of digital information when and where they need it. Roughly three-quarters of Americans own a smartphone today, according to Pew Research Center, and many are being used to research products, compare prices and download coupons, among other things, while shopping in a physical store. In fact, digital interactions now influence 56 cents of every dollar spent in brick-and-mortar stores, according to Deloitte Consulting. These findings underscore the importance for retailers and brands to integrate digital and mobile into their marketing plans and business strategies. In our last installment of the Retail Dive Consumer Survey, we examined how often consumers research products online before buying those items in physical stores. Now in our latest and final installment we explored specific ways the 603 consumers surveyed use their mobile phones while shopping in brick-and-mortar stores. According to our results, the top uses of smartphones while in a store include researching product information and checking or comparing prices. This kind of behavior is even more prevalent among younger shoppers under the age of 35. Our results jibe with a recent Salsify study that found consumers more willing to consult their mobile phones than store associates while shopping in stores. If nothing else, these findings should set off a few warning bells for retailers and brands. They confirm the importance of offering a seamless and top-notch integrated retail customer experience — one that includes mobile. They also suggest work is needed inside the store to improve the customer experience, providing knowledgeable staff and better information at the point of sale. The most common use of smartphones while shopping in brick-and-mortar stores is to research products or look up product information, cited by 58% of consumers in our survey. Checking or comparing prices, cited by 54% of consumers, came in a close second. This means retailers and brands must be on their games, featuring adequate and accurate information both offline and online to meet shopper expectations. Inside stores, this could take the shape of informational POS signage or kiosks, take-home pamphlets and interactive displays. Properly trained and knowledgeable staff, equipped to handle shopper queries, can also make retail stores stand out with shoppers. In the digital realm, just having an online presence is no longer enough. Mobile-compatible capabilities are a must-have. And those who don’t already have a mobile app are behind the curve. Shoppers increasingly expect a continual flow of fresh, compelling content and information — such as detailed product descriptions, images, user-generated ratings and reviews, and personalized offers — to be mobile accessible. 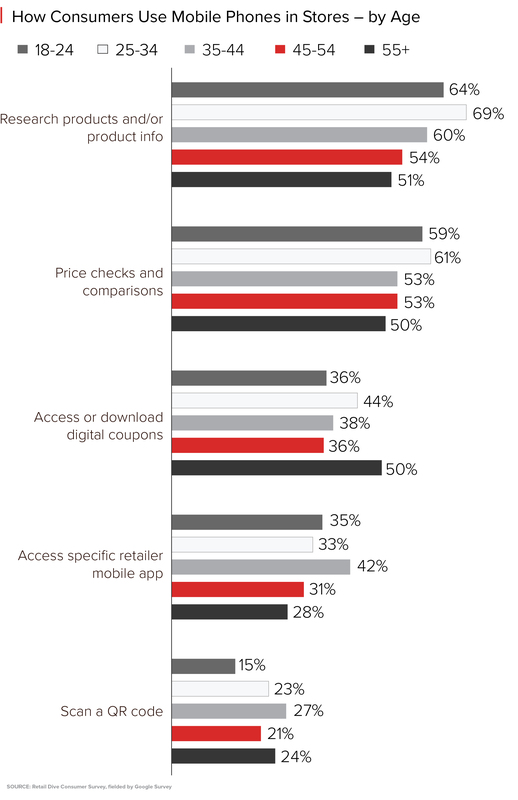 Our survey also found that 40% of consumers use their mobile phones in stores to access or download digital coupons. A third of consumers cited using a specific retailer’s mobile app while in the store. Just 22% of shoppers said they scan QR codes with their smartphones. These findings highlight not only how important it is for retailers and brands to have a mobile app, but that content needs to be both relevant and engaging. No surprises, just more confirmation: Younger shoppers are more likely than their older counterparts to use mobile devices for product research and price checking while shopping in a store. Our survey found that roughly two-thirds of shoppers under age 35 research products on their smartphones while in a store compared with just about half of shoppers aged 45+. 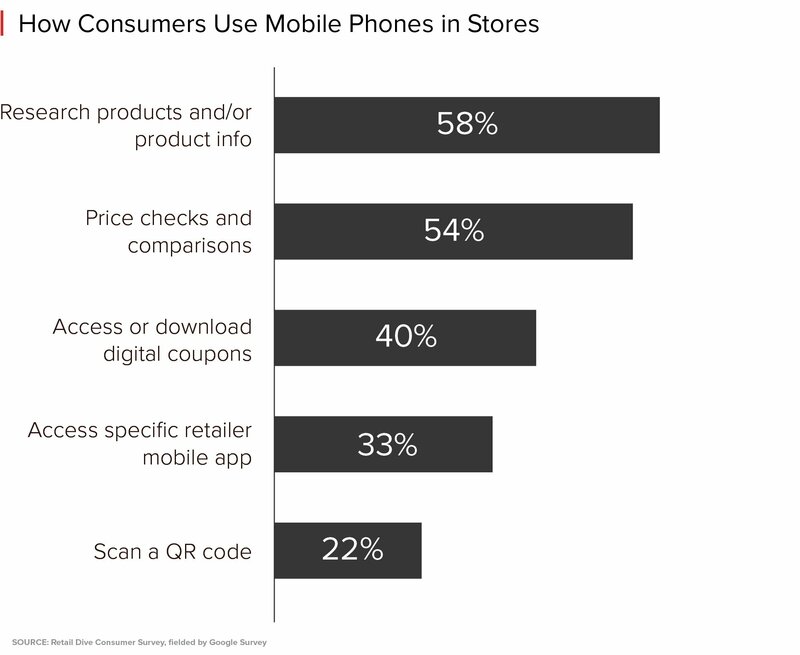 About half of 55+ year-old shoppers use their mobile phones in stores in three primary ways: product research, price checks and digital coupon access. In fact, these older shoppers are more likely than any other age group to use their smartphones to get digital coupons while in the store. This could reflect the senior generation’s deal-seeking and coupon-clipping nature, as well as their need to stretch a dollar as they face down the limited income that comes with retirement. 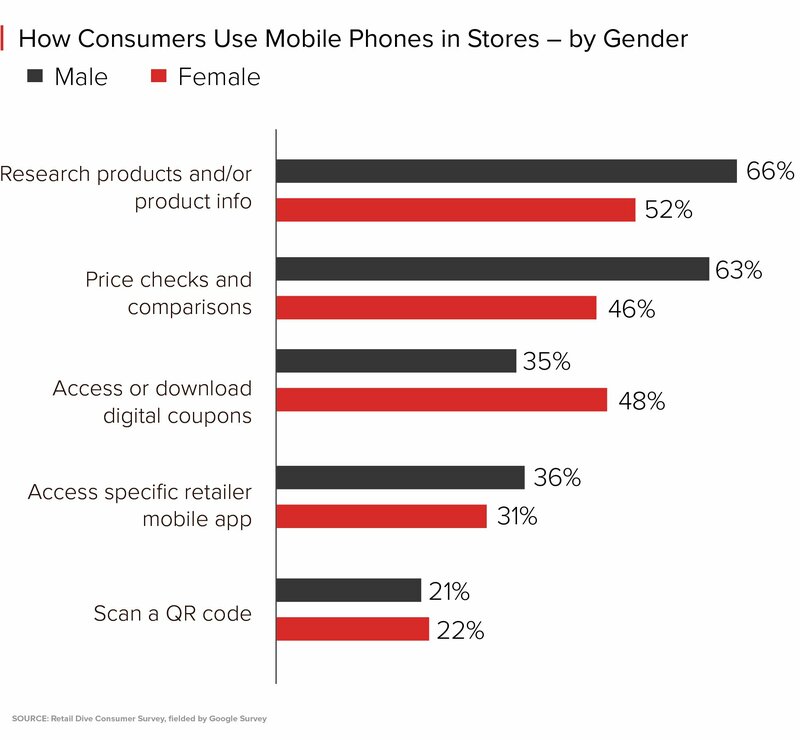 Men are much more likely to conduct in-store product research and price checks on their smartphones compared with women. This likely reflects the more “technical” and big-ticket types of items, such as electronics and home improvement products, shopped more frequently by men than women. Our findings also suggest that men and women diverge somewhat in their deal-seeking habits. A significantly higher 63% of men compared with 46% of women use their mobile devices to check or compare prices while in a store. On the other hand, 48% of women, versus 35% of men, use their smartphones to download digital coupons in a store. Previous studies, such as one conducted by First Insight, have pointed to female shoppers’ affinity for huge markdowns and sales. So “clipping” digital coupons to save money at the store checkout should come as no surprise. Our latest consumer survey findings underscore the important role mobile plays, particularly while shopping brick-and-mortar stores. And retailers are committed to improving and enriching the mobile experience. More than half of retailers say mobile initiatives are among their top three priorities in 2017, according to a recent report from the National Retail Federation’s Shop.org division and research firm Forrester. The other half will need to get on board, and quickly. As the path to purchase increasingly bounces between the physical and digital worlds, retailers not offering a solid and seamless, integrated shopping experience — inclusive of a mobile strategy — could be left behind. This installment concludes the 2017 Retail Dive Consumer Survey series. Thanks for tuning in. We welcome your thoughts on what consumer and retail issues you’d like us to explore next. Retail Dive's Consumer Survey series is brought to you by iQmetrix. To learn more about their endless aisle solutions, click here. iQmetrix has no influence over Retail Dive's editorial coverage.